This summer, we offered our first ever Image Design for Teaching bootcamp — an all day training over the best practices, policies, accessibility, image resources, copyright, and Photoshop skills needed to create informative and organizational images for teaching. The enrollment requests are plentiful, and we’re offering it again, but in a new format. This round will be a month long series occurring each Monday at 1:00. The sessions will each allow for some hands-on practice time during which participants can play around with the skills we’ve just covered while having access to support staff from the Office of Distance Education & eLearning. Sessions one through three will build on each other, with each using the skills from the previous one. The fourth session will focus on building images for Carmen and using prefabricated templates, and this one only requires attendance of Session 1 as a prerequisite. Group size for each session is limited to ten seats in order to allow for effective teaching and support as we cover new tools. Have questions? Email Tara Koger (koger.13@osu.edu). Prerequisite: Must attend Session 1 (“Photoshop Tools Introduction & Basic Image Diagraming for Teaching“) OR be proficient in those skills.This workshop will not cover preliminary skills tools taught in Session 1. 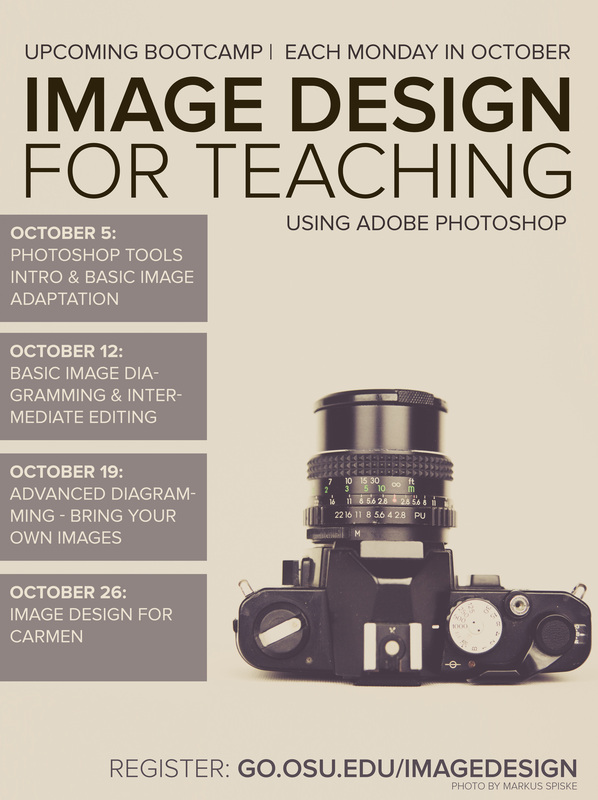 Prerequisite: Must attend Session 1 (“Photoshop Tools Introduction & Basic Image Diagraming for Teaching“) OR be proficient in those skills.This workshop will not cover preliminary skills tools taught in Sessions 1 & 2. Prerequisite: Must attend Session 1 and Session 2 in this event series OR be proficient in those skills.This workshop will not cover preliminary skills tools taught in Session 1 and 2.